Researchers at the University of California, Berkeley, and Massachusetts General Hospital have identified a key region within the Cas9 protein that governs how accurately CRISPR/Cas9 homes in on a target DNA sequence, and have tweaked it to produce a hyper-accurate gene editor with the lowest level of off-target cutting to date. The research team identified a protein domain, called REC3, that acts as a master controller of DNA cutting—an obvious target for re-engineering to improve accuracy even further. 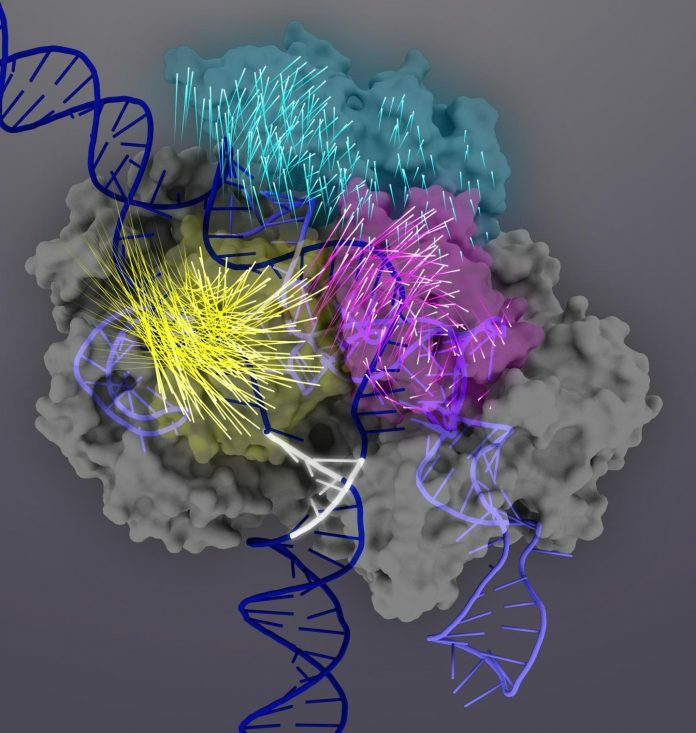 This approach should help scientists customize variants of Cas9—the protein that binds and cuts DNA—to minimize the chance that CRISPR/Cas9 will edit DNA at the wrong place, a key consideration when doing gene therapy in humans. In the past several years, researchers have engineered highly accurate Cas9 proteins—an enhanced specificity one called eSpCas9(1.1) and a high-fidelity one called SpCas9-HF1— and Dr. Doudna and Chen sought to learn why they cut with higher specificity than the wild-type Cas9 protein from Streptococcus pyogenes used widely today. Currently, researchers using CRISPR/Cas9 create a single-guide RNA (sgRNA)—an RNA molecule that includes a chain of 20 ribonucleic acids that complements a specific 20-nucleic-acid DNA sequence they want to target—and attach it to Cas9. This guide RNA allows Cas9 to home in on the complementary DNA, bind to it, and cut the double-stranded helix. But the Cas9–sgRNA complex can also bind to DNA that doesn't exactly match, leading to undesirable off-target cutting. In 2015, Dr. Doudna's lab discovered a conformational switch of Cas9 that is activated when the RNA guide and DNA target match. They found that only when the RNA and DNA match closely does the 3D structure of Cas9, in particular, the conformation of the HNH nuclease domain, change and activate the scissors of Cas9. Though, the process responsible for sensing the nucleic acids upstream of the conformational switch remained unknown. In the current study, the researchers used a technique called single-molecule FRET (Förster resonance energy transfer) to precisely measure how the various protein domains in the Cas9–sgRNA protein complex—in particular, REC3, REC2, and HNH—move when the complex binds to DNA. “Using single-molecule Förster resonance energy transfer (smFRET) experiments, we show that both SpCas9-HF1 and eSpCas9(1.1) are trapped in an inactive state when bound to mismatched targets,” the authors wrote. “We find that a non-catalytic domain within Cas9, REC3, recognizes target complementarity and governs the HNH nuclease to regulate overall catalytic competence. Exploiting this observation, we designed a new hyper-accurate Cas9 variant (HypaCas9) that demonstrates high genome-wide specificity without compromising on-target activity in human cells. “These results offer a more comprehensive model to rationalize and modify the balance between target recognition and nuclease activation for precision genome editing,” the researchers added. Specifically, they determined that the specificity benefits conferred by eSpCas9(1.1) and SpCas9-HF1 could be explained by the fact that the threshold for the HNH conformational switch was much higher for these Cas9 variants than for the wild-type Cas9 protein, making the eSpCas9(1.1) and SpCas9-HF1 variants less likely to activate the scissors when bound to an off-target sequence. Next, the investigators uncovered that the REC3 domain is responsible for sensing the accuracy of target binding, which then signals the outward rotation of the REC2 domain to open a path for the HNH nuclease domain, activating the scissors. This active conformation of Cas9 is then able to cleave both strands of the target DNA. The research team then showed that by mutating parts of REC3, it is possible to change the specificity of the Cas9 protein so that the HNH nuclease is not activated unless the guide RNA and target DNA match is very close. They were able to engineer an improved hyper-accurate Cas9, dubbed HypaCas9, that retains its on-target efficiency but is slightly better at discriminating between on- and off-target sites in human cells.